We’ve just posted some material over at curiosus.co.uk, our blog about conservation and heritage management, on the slogan “Here for Life”, which stands emblematically for an integration between people and places through time, the three critical dimensions of sound cultural heritage management. “I came that they may have life, and have it abundantly”. It is much like the response to the reading of the law in Nehemiah chapter 8. 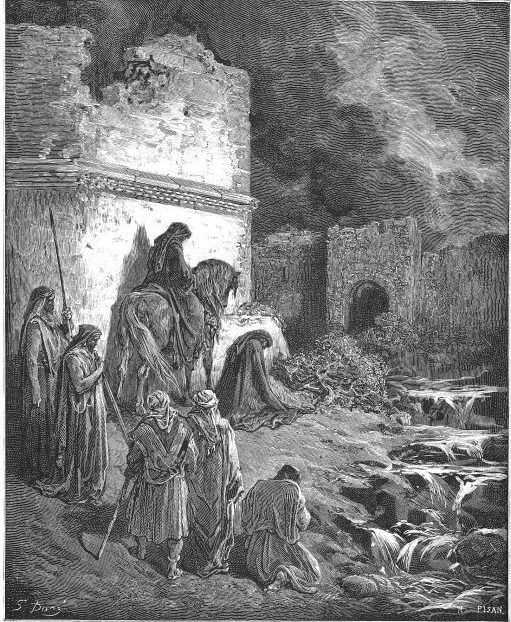 Clearly what looks very much like revival was not caused by the rebuilding of the walls of Jerusalem. But nor would it have happened without that rebuilding, because the walls created a sense of belonging, of restored identity, and of placedness before God. The same is true of our church buildings, of whatever age – or at least it can be if we engage with them properly. So when thinking about your church buildings, “Here for Life” seems a helpful phrase to keep in mind. What can we learn from the story of Nehemiah…? When asked what the Bible has to say about buildings, the first thing I say to them is read the book of Nehemiah – if you are considering a building project, a lot of what you’ll need is in there. Nehemiah is required reading for churches embarking projects because he had many of the same problems many churches face, but of course there are also some important differences. When we read the story, we often focus on the opposition Nehemiah faced. It may be tempting to equate Sanballat and Tobiah with planners, conservation officers etc, but the nature of this opposition was specific to Nehemiah’s political context. On the other hand we can be assured that there will be ‘friction’ – this may come in the form of inertia and apathy, or bureaucracy, or Nimbyism, or the not inconsiderable matter of having a great deal of money to raise. Perhaps the biggest issue that is transferrable from Nehemiah’s story to the present day concerns change. Be aware that as soon as you contemplate a building project you are in the business of change. Change is hard; indeed some people build their lives around avoiding it, seeing it as all threat. Others of a more entrepreneurial spirit embrace change, seeing it as all opportunity; most of us are somewhere in the middle. I see Nehemiah in the second group; we could call Nehemiah a ‘Merchant of Change’. The call of God in scripture is usually out of one thing into something else, something that brings change for the individual and for those around them. I have yet to find the place where God says: “Behold, I do an old thing…!” God is a God of effervescent new creation. So if we are to put ourselves in the way of change, we should be prepared for friction from those who are less comfortable with it. When faced with change, people generally see only the loss involved; often it is only when the new creation, whatever that may be, is complete that we see the benefits. Which is why a successful church building project will need an architect who is thick skinned enough to take the brunt of the pain, while articulating a coherent vision and telling the story of the new creation. For building project it helps a great deal if that story is articulated with the help of a 3D computer generated walkthrough, which gives stakeholders a means of engaging with the future benefits. So if you haven’t done so recently, re-read Nehemiah. If you like, post a comment – particularly on the uses and abuses of Nehemiah’s story – or give me a call if you have anything you would like to discuss.